The leader of Arewa Youths Consultative Forum, AYCF, Yerima Shettima has said that the leader of the Indigenous people of Biafra, IPOB, Mazi Nnamdi Kanu is being influenced by hard drugs and as a result, behaves like a madman. Shettima said his recent decision to force Igbos out of the Northern region of the country was reached solely because of activities and comments by the IPOB leader against Nigeria, the North and president Muhammadu Buhari. The AYCF leader, who recently asked Igbos in the North to ignore the quit notice he earlier issued to them, told the Sun that Nnamdi Kanu was getting out of hands. Shettima said the Muhammadu Buhari-led administration made a big mistake when his governmnet arrested Nnamdi Kanu. He further blamed, “The government to an extent; to have even in the first place arrested this man, somebody who is being influenced by drugs. 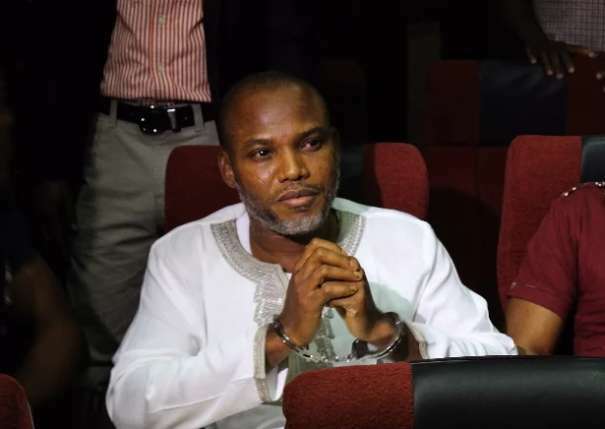 “Who is Kanu in the circle of struggles? So to me it is high time when somebody behaves like a mad man and you behave like a gentleman you realize that this gentleman is getting out of hand undermining everybody, abusing everybody. “You cannot… I am proudly a northerner and that’s my identity. I cannot be a leader at my level and allow this man to be talking and abusing the sensibilities of my people and you expect me to fold my hands. As a leader of the youths, it’s impossible. “We cannot fold our hands when after Jonathan government, no organization like IPOB came on board to abuse that government, now suddenly because we have a government of northern extraction under the leadership of Muhammadu Buhari we fold our hands and allow somebody to undermine that government and abuse the sensibility .We did everything, even MASSOB found it difficult to manage the young man the way he is going about it. “A man who few years ago Ralph Uwazurike employed to work for him suddenly became a tiger and became a tool against the collective interest of the Igbo. Now, nobody can control him. Even the governors and the Eastern leaders this boy has succeeded in holding them to ransom. They are scared of talking for fear of attack from those jobless youths around him. “Suddenly they folded their hands. And you expect us other Nigerians to fold our hands when somebody who has dual citizenship is trying to mess up the country? “From UK to come and mess up the country? No, we’ll ensure that we protect the integrity of Nigeria to make sure that we remain together. No; this is unacceptable. “My recent decision was borne out of frustration with this young man who goes around abusing my identity, my community, my people, undermining a country called Nigeria. I am a strong Nigerian, proudly a Nigerian.